Several centuries ago, the Europeans were the first to sail their ships across the entire world. The economies of the Vikings, the English, the Dutch, the Portuguese and the Spaniards got enormous boosts because of their large ports and sailsmanship. A lot has changed since then. Eight of the ten largest ports in the world are now to be found in China, but Europe still has quite a few very large harbors. Data via American Association of Port Authorities. This Dutch harbor was the largest in the world, until Shanghai and Singapore grew even larger in 1986. This satellite photo gives an indication of the size of the Port of Rotterdam. This very first post on Europeish is about a mountain. A relatively small, Icelandic mountain, that managed to keep almost the entire world in a fierce headlock for several weeks in April and May of this year. Yes, we’re talking about Eyjafjallajökull, the world famous Icelandic volcano. 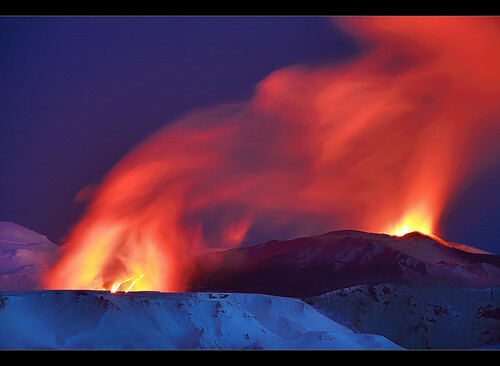 The eruption, the volcanic ash, and the huge ash clouds were annoying to lots of travelers, but equally beautiful to many others, which can be seen in The Big Picture or at BT.dk. Europeish saved and collected a few great photos for this very first post as well.